Thanks for the giveaway! Hope you enjoyed your Thanksgiving & weekend shopping. Thank you for the giveaway. I’d love to win! So many thanks for what you do on this site. I find myself barely having time to coupon at times so you make it soo much easier for me to do so. Thanks again! Would love to win this for holiday shopping. Thank you so much for the amazing chance. would help so much with christmas gifts! Momma needs to buy some toy cars!!! Totally Like Totally Target on FB!!! I love your give aways! I’d love to win!!!! I like you on facebook and follow by e-mail. I like you on facebook by I follow you via your emails. l am a Totally Target fan on Facebook! Love this! Thank you! Just started following you on Facebook. How neat! Thanks for the giveaway! 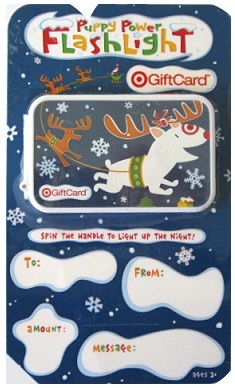 Such a cute gift card! I love it! I get your emails and totally like you on FB! It would be a great time of year to win this! !